Even the most picky veggie eaters will agree that Gurney's Blue Ribbon Hybrid broccoli is delicious! 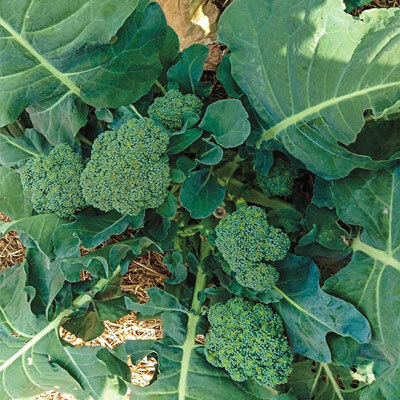 This fantastic variety took the blue ribbon in our 2014 trials for its large, healthy plants that produce giant green-blue heads. It continued to produce huge side shoots throughout the season. Early harvest and sweet, non-bitter flavor with buttery-tender texture are sure to win you over from the season's start to finish. 52 DAYS. Blooms: Will bolt in mid to late Summer if heads are not harvested. Form: Mounded crown with large exterior leaves. Flower Form: Small, sulphur-yellow flowers. Soil Requirements: Rich, well-drained soil, high in organic material. Fruit: Very large blue-green heads with excellent flavor and tender texture. Ample side-shoots after main head is harvested.